Contempo Oval Stone earrings, Blue Quartz/White Mother of Pearl 12.48cts ..
18Kt yellow gold TOUS Pearls earrings with freshwater cultured pearls and friction back..
18kt yellow gold TOUS Rosa d'Abril earrings with cultured pearls. 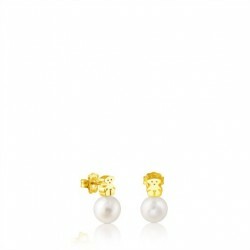 Stud lock..
18kt white gold TOUS Silueta earrings with diamonds and cultured pearls. Total carat weight 0,10ct. ..